March 19, 2018  Cornelius' Keigo Oyamada deconstructs and reassembles music like it's a neon cubist-pop sculpture. 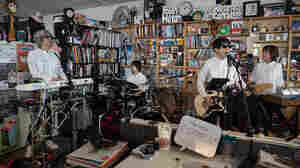 On a rare U.S. tour, the Japanese band brought its complex cool to the Tiny Desk. July 13, 2017  Cornelius makes some of the coolest music in the world. In the Japanese musician's first album in 11 years, his plunderphonic neon-psychedelia turns meditative. May 12, 2017  This is truly visual music, and a rare case in which one enhances the other. June 21, 2016  On this week's All Songs Considered: psychedelic rock from the '90s, new songs from Tiny Desk veterans and electro-folk from the Israeli sisters in A-WA.